It is a big day, maybe the biggest of the year. 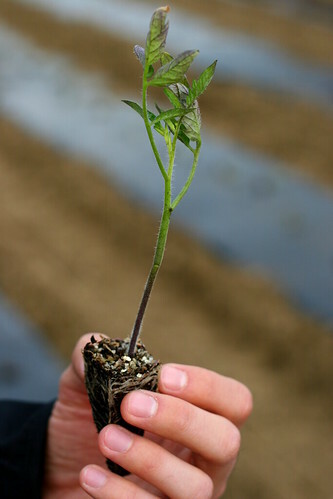 This day, our little tomato plants begin their life on the farm. Throughout the morning, we have been introducing them to their new home in the field across the canal from my house. 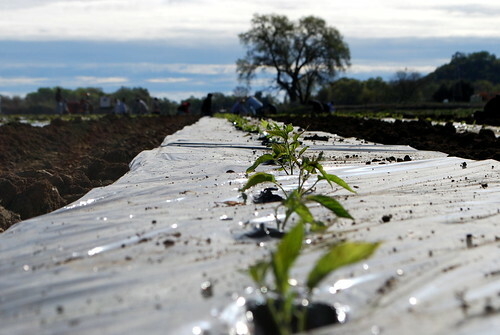 We already prepared their beds with hidden drip irrigation lines and a mulch to discourage weeds. 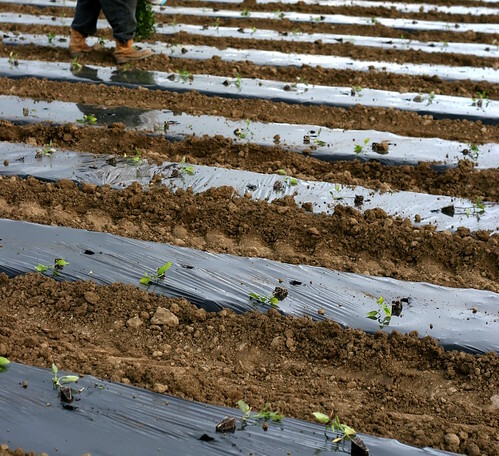 Each plant gets a drink of water before we carefully embed it into the field and leave it to become acquainted with our Yolo silt/loam soil and mild, overcast sky. These young seedlings are fragile things. Their tender, delicate leaves were formed in the luxurious growing conditions of the greenhouse, and in these early days, I play the role of the over-anxious mother. The first two weeks are the most trying. A gust of wind that threatens to develop into a gale also threatens to form a knot in my stomach. 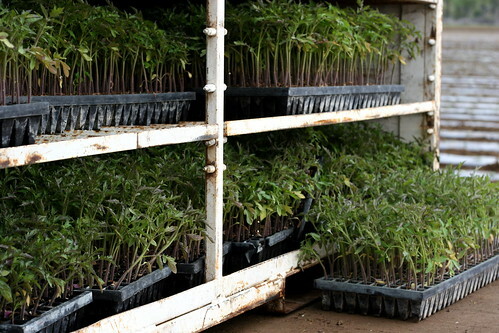 If I am forced to put on a wool cap to guard against a cold wind, I feel for all those tomato babies who lack the resources to don a wool cap of their own. The weather forecast is closely analyzed and frequently refreshed on my phone. Historically, the last week in March marks the end of the frost threat in our part of the Capay Valley, but just last week we had some 35-degree nights, so I reserve a small amount of anxiety for cold weather. 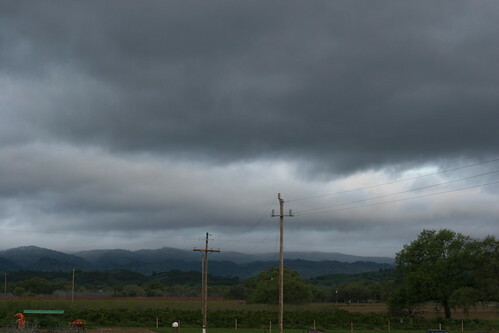 Rain on the horizon is greeted kindly because it brings moderate temperatures and free irrigation. 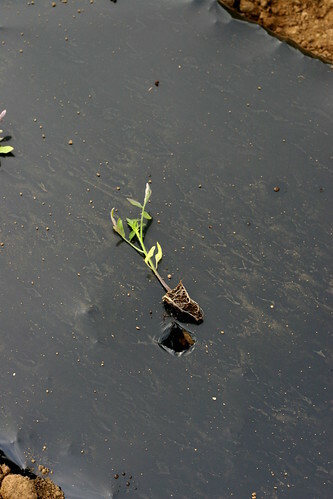 It’s true that an extended rain that saturates the soil for an extended period of time could enable disease in the tomato roots, but those types of unrelenting rains are rare out here. On the other hand, anxiety aside, the tomato planting is extremely exciting. This is the beginning of the busy season on the farm, and I feel that we have another chance to do everything right this time. Farming is nice like that; each year the challenge is roughly the same. We have grown tomatoes on this part of the Capay Valley every summer for over 35 years, and I am appreciative of the fact that for the most part, this year we will face the same conditions as last year and the years before. We have learned from decades of mistakes and successes how to do this, and this season I am eager to employ our best and most developed methods. Wish us luck! Yesterday afternoon the beautiful old water tower broke in half and fell over. 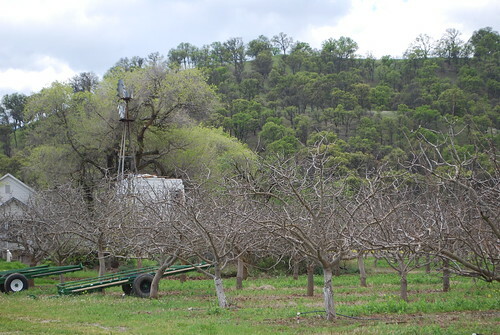 The tower and accompanying farm house are located between the Asian pears and the pistachio trees, and were built over a hundred years ago. 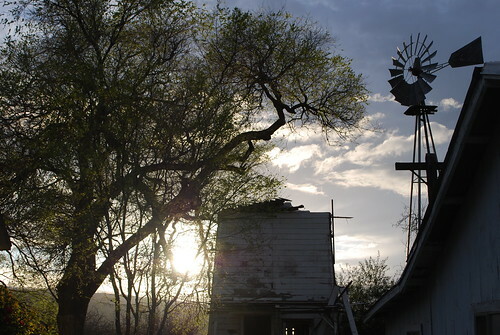 The lighthouse-shaped tower and the wind-powered water pump stood around 40 feet tall until a walnut tree started growing into the side of the building and slowly pushed the roof into a slumping position. Yesterday, under the weight of the rain water that saturated the leaky roof and exposed siding, the leaning top half slid off and crashed down in the mud. I was on the other side of the farm when I heard the sliding and splintering sound of the weight breaking free, followed by a brief crash landing. 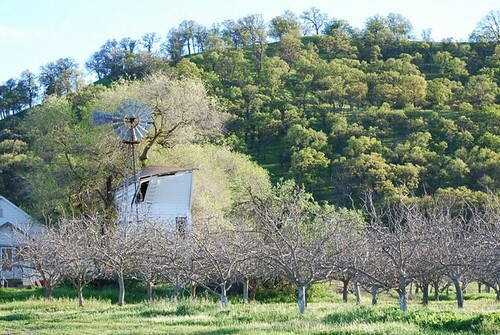 Before it crashed, my brothers and I had been dreaming of restoring the rustic water tower and wind mill to glory. The collapse has woken us up from our dream and now we must take action to save it. We can’t scrap it or just let it rot, the water tower is way too cool. We've got outstanding news! 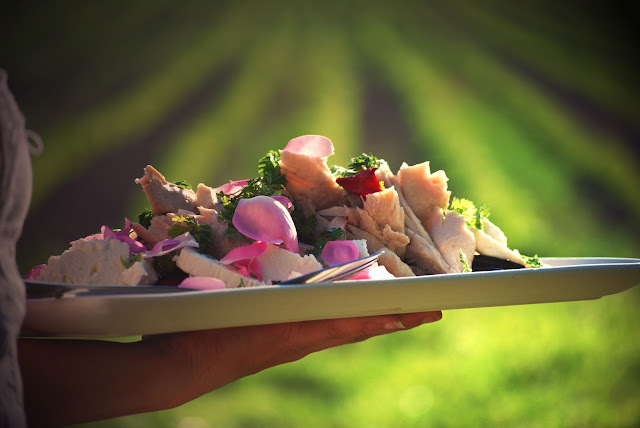 This year our farm was chosen to take part in a "roving culinary adventure - literally a restaurant without walls" - as the acclaimed Outstanding in the Field is headed out to Capay early this summer to host a dinner on the farm, Sunday, June 24th. With a mission to "re-connect diners to the land and the origins of their food, and to honor the local farmers and food artisans who cultivate it" we cannot be more excited to take part in this Outstanding event. Before everyone settles in at the table for dinner, Thaddeus, Noah and Freeman will give a tour of the farm and tell a little about our story and philosophy. Then together the farmers, culinary artisans, producers and guests will share seats at the long tables for an amazing meal from Executive Chef Oliver Ridgeway of Grange Restaurant in Sacramento. Ingredients for the meal are local - some of which might be sourced within inches of your seat at the table. There's no shortage of gorgeous farmland in California, and we're so very honored to be chosen for an Outstanding in the Field dinner. We've been told it's an evening not soon to be forgotten, and we're so very excited to be able to share this event, a culinary milestone, with our Farm Fresh To You community. Tickets go on sale through the Outstanding in the Field website on Tuesday, March 20, at 9 a.m. Tickets for the event are $180 per person for a wine and appetizer reception followed by a 4-course meal with wine pairings. Tickets often sell out fast! We can't wait - and hope to see you there! Heat oil in medium/large skillet over medium heat, add leek to pan. Cook for about 1 minute, shut off heat and toss in the chopped spinach until coated and wilted from heat. About 1 minute. Season with salt and pepper. Make sure chicken is dry, pat it with a paper towel if needed…then cut into quarters and season well on all sides with salt and pepper. Over medium heat, melt butter in a large skillet until it gets a bit foamy, add chicken and cook until golden on each side. Remove chicken from pan and set aside. In the same pan over medium heat, add the leeks, mushrooms, salt, pepper, herbes, and thyme. Cook for approx 1 minute stirring so that everything in pan is coated with the remaining butter. Next add the cream, stir, and then add the Madeira, stir. Add the chicken back to the pan and finish cooking the chicken with the sauce (keep it on a low boil) flipping the medallions once throughout the cooking process. Cook approx 10 minutes uncovered. If you like a thicker sauce, remove chicken and cook another 2 minutes then return chicken to pan to warm. 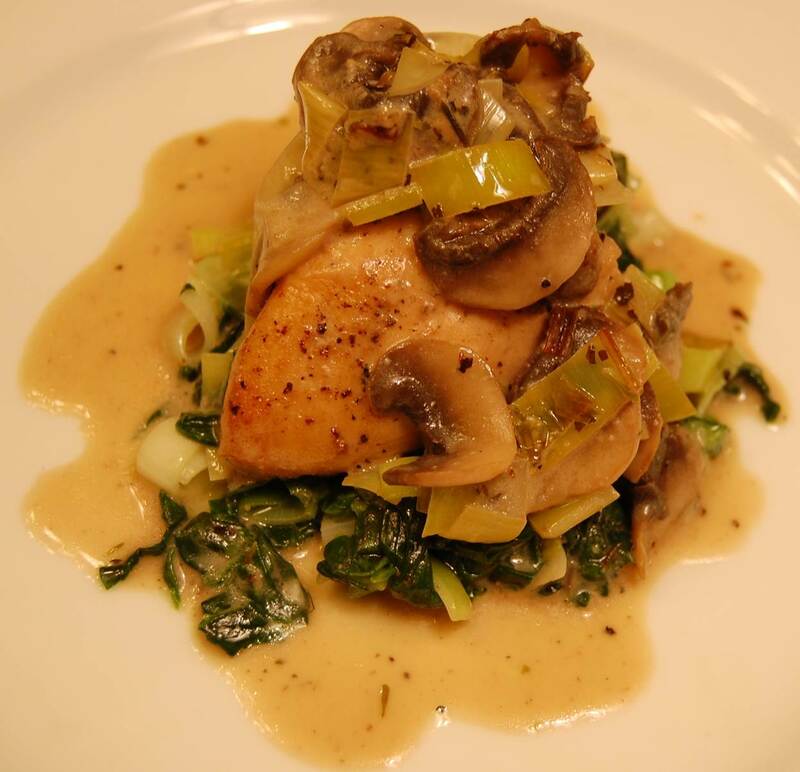 Top sautéed spinach and leeks with the creamy chicken and sauce. Heat oil in medium/large skillet over medium heat, add spinach and tomatoes to the pan. Cook for until just wilted from the heat (about 1-2 minutes). Place mixture in a strainer and press gently to drain excess water. Mix spinach and tomatoes with feta. Season with salt and pepper. Reserve until pastry is ready to go. In a food processor, pulse the ice-cold butter and flour until it is fine crumbs. Add the salt, pepper, thyme and then pulse briefly. Pulse processor and while running, add the water a tablespoon at a time. Blend for another 30 seconds, then quickly empty the dough onto a piece of plastic wrap. It may be loose…quickly form in a ball shape and wrap tightly and put into fridge until the onion filling is complete (at least 30 minutes). Take the pastry out of the fridge. Have a very lightly floured area to work on, unwrap the dough and smack it a few times with a rolling pin to make it easier to rollout. (You must work quickly in rolling this out, so that the butter does not warm otherwise your crust will not be flaky). Roll the dough into a circle and keep it 1/4 of an inch thick. Move the pastry very carefully to non-stick cookie sheet. In the middle of the pastry, add the spinach, tomato and feta mixture around the tart. Then work around the tart to fold over the edges onto the onion mixture. Brush the edges of the tart with melted butter and bake in the oven for about 40-45 minutes or until light golden brown. Let cool about 10 minutes before serving or let sit out overnight and serve the next day. Tracy Kontos and Alejandra Schrader, co-founders of Cucina Cocina are excited to be using Farm Fresh To You fresh organic produce for their upcoming cooking classes. With our seasonal ingredients in mind, they have graciously shared a few of their recipes with you – our CSA members. We hope you enjoy them! Tracy and Alejandra met during the taping of MasterChef Season 2, a show with Chef Gordon Ramsay. From over 30,000 applicants, they both made it to the Top 10. Driven by their passion for food and love for the art of cooking, they decided to leave their careers after the show and founded Cucina Cocina in August, 2011. Cucina Cocina is a private chef service based in southern California that focuses on private events, catering, corporate team building/wellness cooking classes, as well as life-style cooking classes for the public. Farm Fresh To You members receive $10 off Cucina Cocina cooking classes. Click here for a list of their upcoming classes. Their Mission: to change, empower, and educate people through sharing the art of cooking and the love for great, locally produced food. They are committed to helping communities grow, develop, and connect. Both Tracy and Alejandra are committed to the environment, support sustainable farming practices, farmers markets, and community supported agriculture.